First order of business; I used to hate single buckle waist harnesses and harnesses with non adjustable leg loops. This mainly stemmed from the fact that I've always had a Petzl Corax harness and thought it was perfectly adjustable and extremely comfortable. Well, that way of thinking, for me, has been shattered. The Black Diamond Chaos harness is simple yet extremely usable. The comfort of the Kinetic Core construction is surprising and extremely light weight as well. Black Diamond hit the nail on the head again with a superb product that functions well, exudes confidence and takes climbing softgoods technology and construction a step further. Yes the Dead Bird company came out with a super lightweight low profile harnesses first, and yes, they are very nice and extremely well made, however the Arc'Teryx "luxury" tax is always a point of contention with me. Their products always have an inflated price tag for minimal benefits, if any. Simply put, Black Diamond has come back with an affordable harness that weighs about the same as other super lightweight harnesses and it even has better gear loops. The flatlock seam, elastic leg loops and super smooth speed buckle are all additional features that improve the harness. The attention to detail is easily recognized. If you look at the harness it doesn't seem like anything special, but when you pick it up and climb in it you will easily recognize why so many people are using it. The waist belt is wide enough to provide ample comfort and durability, but with the Kinetic Core construction the harness stays lightweight and flexible. The gear loops are spaced quite nicely and keep your gear hanging at your sides, not too far forward or back and when you have the harness on pulling a quickdraw from the gear loop has never been easier. It still boasts a haul loop for tag lines and uses speed buckles to make adjusting the harness a cinch. Going back to my Petzl Corax I have noticed that the gear loops are toward the back of the harness and pulling gear doesn't seem as fluid. The double waist buckle also throws off the overlap of padding in the front and actually creates an uncomfortable gap. The Chaos does not do this. 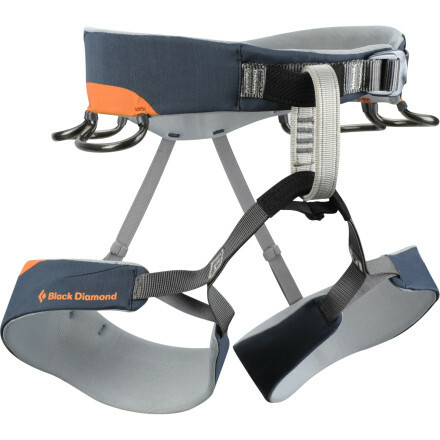 The aesthetic of Black Diamond's harnesses is also better than most other climbing companies. They have started using vibrant colors and different combinations to make them appealing to all climbers. They used to be on sale at Sierra Trading Post, but recently sold out. STP does have the two gear loop brother and sister Ozone (3485C) and Aura (3484Y). Take a look and check out Black Diamond's Kinetic Core construction. Final Say: Whether your plugging gear in the Utah desert or hitting enduro sport routes in some foreign country, this harness does it all, keeps you comfortable and keeps you confident.